Display ornamental items in a unique fashion with these glass shelf lights. Various finishes and sizes make it easy to find the right shelf light for your home. 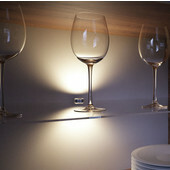 The glass shelf lighting generates uniform decorative light effects.